Designing an IKEA kitchen can be a game of inches. 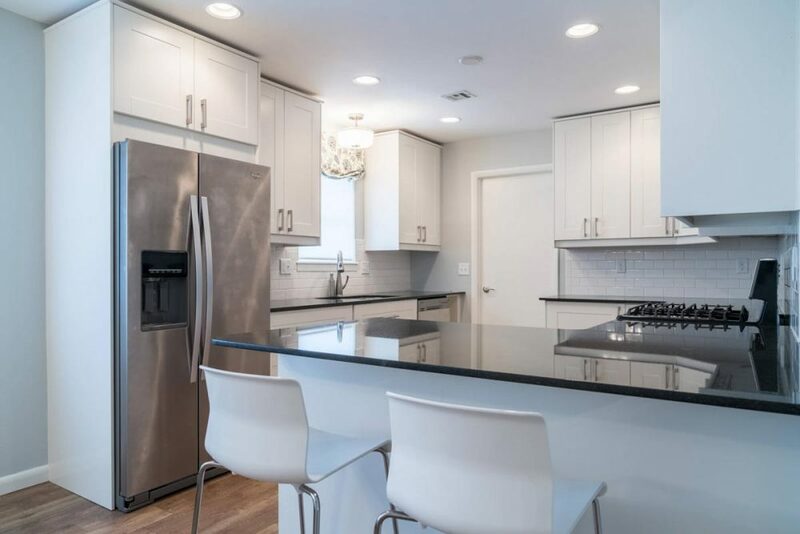 This was the case for IKD customer Brian from Brooklyn, NY, who recently remodeled his galley-style kitchen to accommodate very specific design needs. He explains: “It’s not the biggest kitchen (15’5″L X 8′ W), so it was a challenge fitting everything in and having adequate counter space. We cook every day and also entertain a lot. It opens into a good-sized dining room with a large table so it’s easy for everyone to talk while making dinner.”Therefore, Brian and his spouse required having a dishwasher installed and plenty of counter space – set against a Mid Century modern aesthetic. So, with a budget of $35,000 they combined IKEA SEKTION cabinetry framework with Walnut cabinet doors in Matte White from Semihandmade, Lewis Dolin brass door knobs and IKEA MAXIMERA drawers. Inspired by kitchens on HOUZZ, Brian knew though that to accomplish his dream space he needed professional assistance. So he worked with IKD’s design team for the layout and hired David’s Interiors as the general contractor. This was particularly important when he encountered an unusual design dilemma affecting the installation: The plumbing was running through the cabinetry in the original layout. “It was obvious to me and I discussed it with the contractor. So, the general contractor had to build out a wall. That’s why we couldn’t originally have a dishwasher [in the kitchen],” he describes. As a result, while this kitchen was originally small on space, the remodeled kitchen is certainly now big on style, he says. Let’s see how this IKEA kitchen was created for Brian! Brian selected IKEA SEKTION cabinetry based on its reputation and affordability, and combined that with Semihandmade’s custom door options. “The kitchen ceiling height is 105” and the wall cabinet alignment is 94-1/2”,” he says. So, Brian and his spouse chose Semihandmade’s Flatsawn Walnut for the base cabinets and cabinetry above the Beko refrigerator to create a built-in look. The warmth of those cabinets were paired with Semihandmade’s Supermatte Slab white wall cabinets over the range and sink as well as IKEA MAXIMERA drawers. “We got taller cabinets for the uppers on the walls plus increased storage under the island. The style of the cabinets fits in with all our Mid Century modern furnishings and wood trim,” he adds. This was even more impressive considering that Brian and the contractor had to overcome some obstacles due to the original construction of the kitchen. “The wall behind the cabinets was essentially horsehair plaster on brick, and also the issue with the plumbing was running through the cabinets,” he explains. Lastly, Brian opted not to use IKEA’s under cabinet lighting system, instead choosing a lighting system recommended by the general contractor’s electrician. Adding to the Mid Century modern theme is a variety of stainless steel appliances and plenty of counter space. For instance, the kitchen features a 28″ wide and 9″deep MR stainless sink with a Kraus faucet. Next to that is a Samsung range and microwave, a Bosch dishwasher and the aforementioned Beko refrigerator. “The dishwasher features a Semihandmade cover panel and is located to the right of the range,” Brian explains. Complementing the look as well is a beveled subway tile backsplash and poured concrete flooring. Another eye-catching element of this IKEA kitchen is the custom island. The colorful island – which separates the kitchen from the large dining room – also has Verner Panton Topan pendants hanging over it, chosen once the island was completed. In fact, the lighting is one of Brian’s favorite elements of the design. “I really like the lighting, especially the undercounter lighting and the pendants,” he says. Concluding, Brian offers some advice for future IKEA remodelers. As design experts, we find that the one area often overlooked is the laundry room, mainly because people associate it as a utilitarian space. But it can be much more than that. Especially with the right IKD design. Think of it this way: A well-done laundry room (or any space for wardrobe) is like the perfect pair of earrings or cuff links to complete an outfit. It completes the design theme you’ve chosen – and ideally – complements your lifestyle. The available styles in IKEA cabinetry are as unique as our customers and might ultimately reflect the design theme of your home, or specific rooms like your kitchen, office or closets – even wine storage! Keep in mind: most of these areas can use the same IKEA SEKTION cabinetry framework you are using for your kitchen. Bathroom wardrobe areas can also use the IKEA GODMORGON cabinetry framework. Making the process simpler for you, of course, is IKD. We apply the same expertise to laundry rooms that we do with kitchen design. Our design process includes an online questionnaire for you to fill out and provide examples of spaces you love from HOUZZ, Pinterest, and the IKD portfolio, etc. so that we know what you want from IKEA and your laundry room design. Then we ask you to scribble your room measurements and upload photos of your space for us to review. We then provide a draft and give you an opportunity to modify the Concept Design. Finally, we provide a design package with full-color renderings, elevation views, and an IKEA materials list with pricing, including extra items that are needed and options for custom cabinet doors, if desired. We’ll even consider space in your laundry room for your furry family members if needed – including a sleeping area and washing/grooming area. Pets need to look their best too! So let’s take a look at how the right laundry design, in the right hands, and with the right IKEA cabinetry, can make all the difference for you. 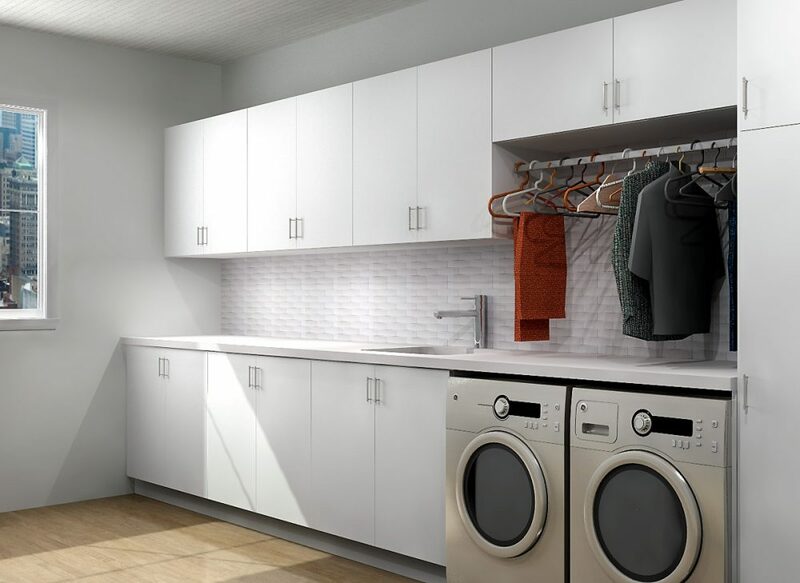 A well-designed laundry room with IKEA cabinetry will make your life easier and your home sparkle. 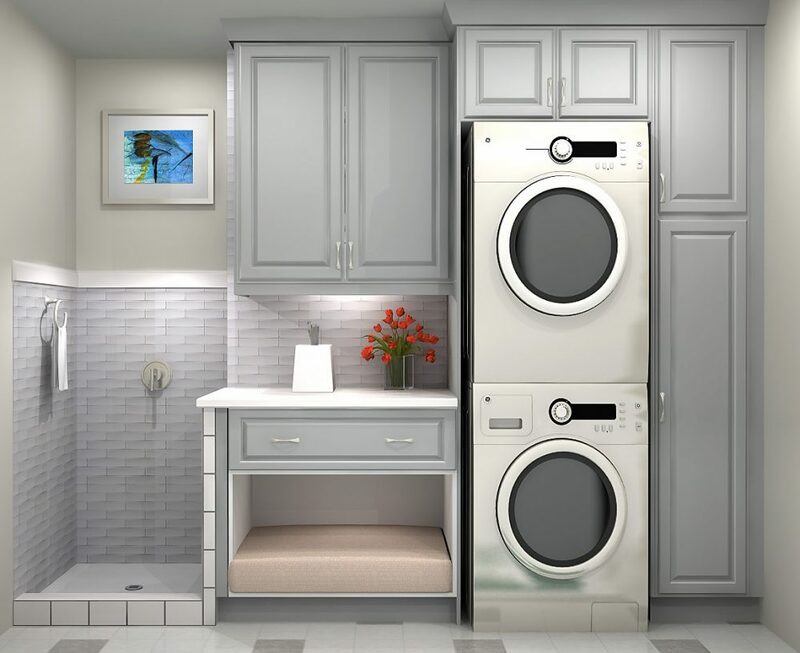 IKD can design your laundry room and style-wise, there really are countless options. So if you have a sleek-looking washer and dryer combo – and traditional design sensibilities – consider the black-brown IKEA LILLANGEN high cabinet, which can have its door mounted to open from the left or the right. Better yet, it will provide ample storage for towels, soaps and detergents. Or try a color-coordinated laundry room look using IKEA SEKTION cabinets; include a pull-out for trash or a corner cabinet with carousel to maximize space and storage. To create a unique two-toned color scheme, consider using black stained IKEA LERHYTTAN base cabinets with the off white IKEA GRIMSLOV door style for the upper cabinetry. Or perhaps your design calls for a custom look. Then the super matte shaker light gray door style from Semihandmade is another option to bump up the style in your laundry room. For practical solutions, try the IKEA GRUNDTAL drying rack to hang towels and shirts. Notably, the width of the GRUNDTAL drying rack can be adjusted to better suit your space. Of course, just like with other rooms in the home, size matters. So for larger laundry spaces, consider the black-brown IKEA PAX or the white IKEA BYGSTAD wardrobe units to store out-of-season clothing. For smaller spaces, keeping things tidy and maximizing counter space is imperative. Think of the SEKTION pull-outs, corner cabinets and high cabinets to provide storage for detergent, laundry, etc. Try complementing that with an IKEA MULIG clothes bar over your countertops to hang clothes while you fold or the IKEA ALGOT wall upright/shelves/drying rack system for convenient and flexible accessory options. You can find plenty of IKEA accessories to put the finishing touches on the laundry room, such as the IKEA BRANAS laundry basket, the IKEA PLUGGIS recycling bin, and the IKEA DANKA ironing board. And of course don’t forget lighting. The IKEA OSTANA wall lamp will illuminate shelving or a nearby utility sink in the laundry room to make every task lighter, and brighter! Remember, whether you need your IKEA laundry room to be serviceable, or to make a statement, the options are really endless. Our last recommendation is to begin your IKD design now so that you can take advantage when the next IKEA sales event is announced! Sometimes, you need to go with the flow. 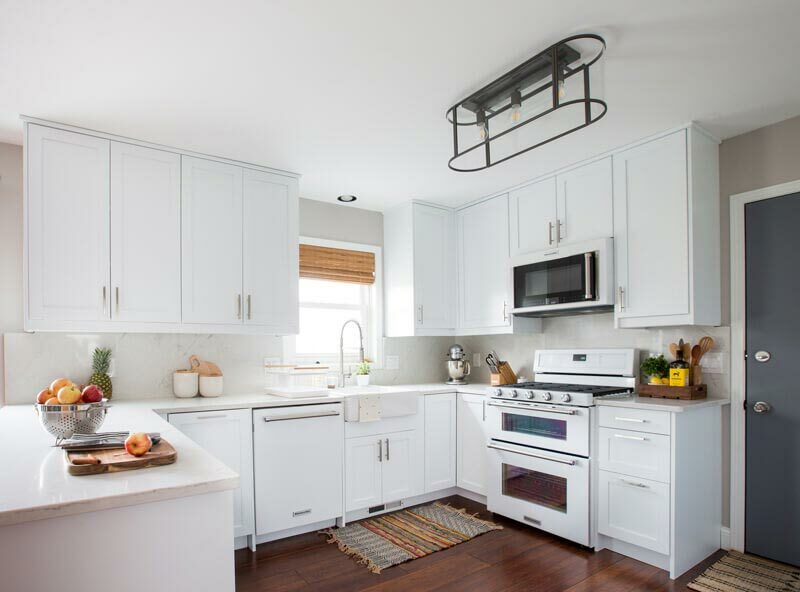 Such was the case for IKD customer Paige from Richmond, CA, who along with her husband remodeled their previously outdated 1990s-styled kitchen into a stylish IKEA kitchen with ample storage. “We knew we wanted to convert our cramped U-shaped kitchen into an open concept with better flow,” she says. “The original kitchen had zero flow. 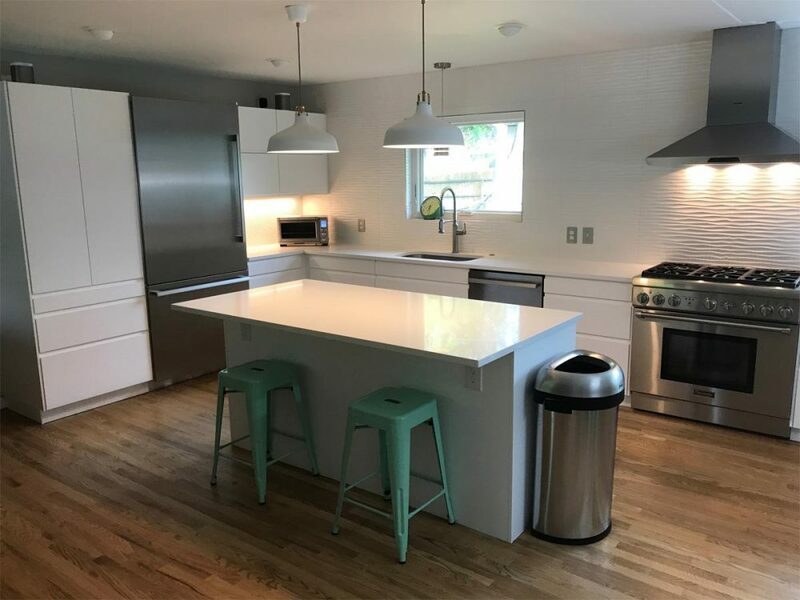 For example, if you were cooking and someone needed to get into the refrigerator, you had to move out of the way!” Specifically, they wanted a Mid Century-inspired design theme , featuring more work area with open spacing and better overall storage – all within a budget of $30,000. Opting to do the remodel themselves, the couple paired IKEA SEKTION cabinetry hardware with Mahogany Slab Cabinet Door/Drawer Fronts and Side Panels from Semihandmade and accented by IKEA BLANKETT aluminum handles. “The appeal for us with IKEA cabinetry was the modularity and cost. There’s so many combination options and we could install them ourselves,” she describes. They also chose IKEA’s FÖRBÄTTRA (now IRSTA) and STRÖMLINJE cabinet lighting system to highlight the IKEA NUTID slide-in range with gas cooktop and custom laminate countertops from Wilsonart, which feature a unique green color called Sprout. 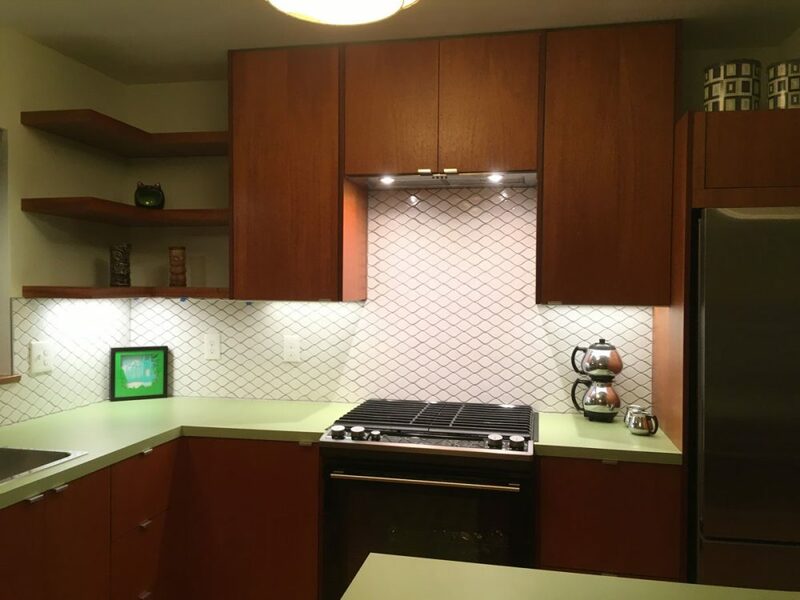 “We also did a white ceramic teardrop tile backsplash with silver sparkle grout,” she says. Other appliances included are: A NUTID microwave (installed below the counter of the free-standing island); an IKEA RENLIG built-in dishwasher; an EVENTUELL built-in extractor hood; an IKEA LÅNGUDDEN sink and an IKEA ÄLMAREN kitchen faucet with pullout spout. These products were complemented by a stainless steel refrigerator from Fisher & Paykel as well. Rounding out the look are 50s reproduction ceiling lights from Lounge Lizard in Portland, OR, and an Astron 8” two-tone aluminum pendant over sink light from Rejuvenation. “We had never done a remodel ourselves. We wanted to do as much of the work ourselves to save money but were worried that any mistakes could end up costing us more in repairs.” To cover their bases, the couple recruited IKD’s design team to guide them through the process, especially for the complete parts listing so they wouldn’t overlook any items. Let’s see how this kitchen came together! The couple relied on IKD to design a workable solution.“I think what IKD came up with really worked out,” she says. To achieve the more open feel with more storage, the couple relied on IKD again.“We weren’t 100% sure we wanted the refrigerator to stick out into the perceived living room area but it ended up really looking nice,” she says. “Semihandmade were incredible to work with as well and the mahogany wood we chose is gorgeous. Choosing the color of the cabinet fronts from Semihandmade took some time because we wanted the wood colors to compliment each other.” The cabinetry look is rounded out by paint colors called Wheat Grass, featured on the shared wall from living room, as well as a color called Spinach White. “We also replaced our really awful linoleum floors with oak hardwood floors that matched the rest of the house,” she says. Without a doubt, IKEA is a world unto itself. And it’s so big that it’s led to third-party companies whose mission is to provide kitchen products or design services that are complementary to IKEA cabinetry. IKD is one of those companies. Another of those companies, on the kitchen cabinetry side, is CA-based Semihandmade . Semihandmade is considered a pioneer in the growing IKEA ecosystem of “hacking” IKEA products and providing stylish and affordable cabinet door options that fit IKEA kitchens, bathrooms, closets and media systems. And just as each company serves the needs of IKEA kitchen customers without being formally partnered with IKEA, so too do the two companies organically work together to improve the final results of your IKEA kitchen design. Therefore, it’s more a symbiotic rather than a formal relationship, but with a strong, shared message: You have choices, and the IKEA kitchen experience is not daunting! Simply put, when a Semihandmade customer needs design guidance, or an IKD customer realizes they desire more kitchen cabinetry options than what IKEA offers, the two companies refer each other’s services. In fact, on the IKD online design questionnaire that customers fill out to provide their kitchen information, IKD specifically asks for the front style the customer wants. “We have Semihandmade listed as an alternative if they don’t want IKEA fronts and we have embedded Semihandmade’s Web site URL to our form so it’s easier for those customers to check their options!” she adds. In total, Semihandmade offers over 40 standard cabinet offerings including paintable Shaker and MDF doors, colored thermofoils, real wood veneers and textured melamines. Although after-market and unaffiliated with IKEA, Semihandmade also works with a third of the nearly 50 U.S. IKEA stores on warranty issues related to IKEA’s discontinued AKURUM kitchen system, as well as providing cabinetry for IKEA’s SEKTION cabinetry framework for kitchens; IKEA’s GODMORGON cabinetry for bathrooms and IKEA’s BESTA media cabinetry. Making the IKEA design process easier is what it’s all about for the two companies. Meanwhile, IKD, with its extensive knowledge of IKEA’s home planning software and IKEA’s SEKTION kitchen system helps customers feel prepared in their product selections, design theme and layout. This is important because one thing an IKEA kitchen customer wants with the IKEA design experience is peace of mind. So simply by referring each other’s work, IKD and Semihandmade often create impressive IKEA kitchen designs for their customers. And that is something that McDonald does not see slowing down. “The design-build market seems to grow every year, which benefits not only Semihandmade and IKD, but the customer who has an ever-expanding selection of great companies to choose from,” McDonald says. So what kind of experience can you expect when working with both companies? IKD will also include Semihandmade’s door options in the customer 3D printouts that IKD provides for customers during the design process. ** 3D printout with Semihandmade Supermatte White Shaker fronts for perimeter, Supermatte Navy Shaker for the island and Oak Floating Shelves. “We can include Semihandmade’s doors in the customer 3D renderings. It’s part of our job to keep up with Semihandmade’s inventory and discontinued materials. I personally am constantly checking their Web site for updates and when they discontinue an item (for example the open cabinet solution) they are kind enough to inform us so we can take that into consideration when designing ,” Paulina says. For a perfect example of the complementary efforts of each company, look no further than IKD customer Beth, who collaborated with IKD and Semihandmade recently. With her kitchen, she was able to turn a gutted home into a contemporary IKEA kitchen masterpiece – at a fraction of the cost. We called that design “affordable luxury,” and can do the same for you. For more information about Semihandmade, visit www.semihandmadedoors.com or email at info@semihandmadedoors.com. Find out how IKD can help with your IKEA kitchen design by clicking https://inspiredkitchendesign.com/. Ask IKD customers Maggie and Greg from Rockville, MD and they’ll tell you their IKEA kitchen is twice as nice. After all, this is the second kitchen the couple has done, with Maggie – an experienced home renovator – installing the cabinetry and acting as general contractor. 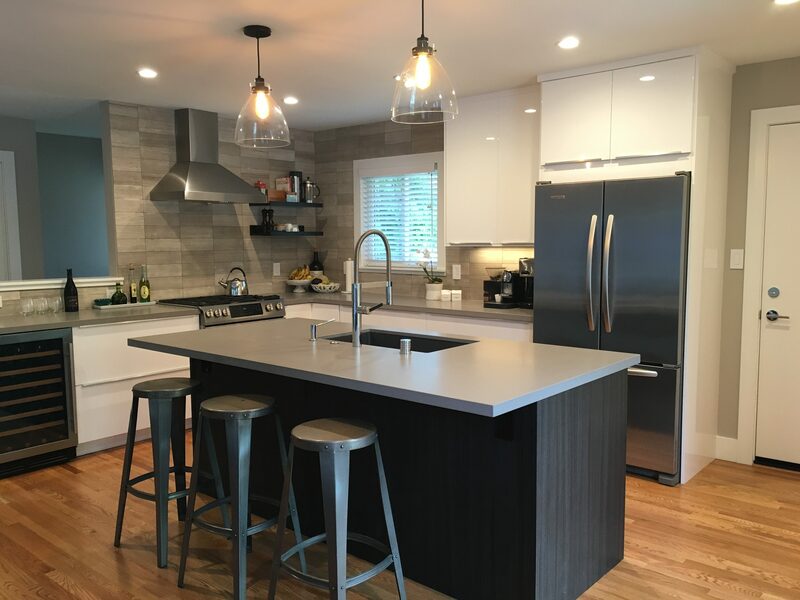 “In this project we were removing a wall, installing a new window, interlacing new hardwood with existing, moving every major appliance and adding a dishwasher. It was a blank slate, which was both exciting and daunting,” Maggie explains. With that in mind, the couple had three specific design wishes for the 125- square-foot kitchen: To open the kitchen to the living and dining areas, to maximize storage, and to build a modern space that didn’t look out of place in a mid-century home. All within a $25,000 budget. Therefore, IKEA VEDDINGE upper cabinetry was used with IKEA SEKTION framework. The IKEA VEDDINGE was paired with Eco Teak cabinetry from Semihandmade, to create a sense of warmth. Maggie and Greg also selected a Bosch 800 Series Dishwasher with a custom panel made by Semihandmade; a Zephyr Layers Hood; a GE Profile Range with induction cooktop; a Kraus sink with dish drainer (60/40 split), and a Hansgrohe faucet. The countertops are acrylic from LG Hi-Macs, called Kamet, and were installed by Topline Countertops in Frederick, MD. “We came in just over $31,000. We splurged on the Quad Sliding window and our appliances,” she says. Despite being an experienced DIYer, Maggie notes that she wouldn’t have been able to get the finishing touches done without working with IKD’s design team. “Working with IKD made choosing finishes much easier because I had the design on paper to help me visualize,” she concludes. Maggie decided to work with IKD for multiple reasons.“IKEA’s home planner online tool, while helpful, is so buggy that it makes it difficult to be exact,” she says. “Once I had the basic design, I used IKD’s service to double-check my work; have professional drawings to turn in for permits; and have a professionally produced shopping list. The shopping list alone is worth IKD’s very reasonable rates!” She adds that seeing the initial IKD design allowed her to think about the ergonomics of the space, such as storage considerations, where appliances would be placed; and general functionality and flow. Natural light was an important component to the kitchen. 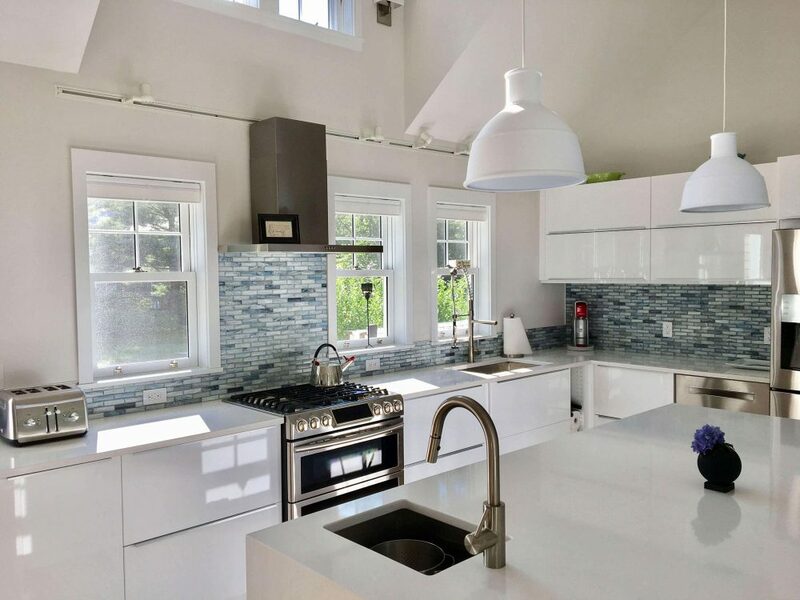 She explains: “Natural light is the reason we chose to have the upper cabinets be white. Our ceilings are only 8’ and adding skylights and using white uppers really helps them to feel much higher.” The couple contracted window installation to American Windows and Siding of VA, who did the kitchen window as part of a whole-home window replacement project. “We love our Kolbe Quad sliding window. Eventually, we’d like to put a bar on the deck out back so that we can pass food and drinks from inside to out,” she says. However, the window treatment did cause an unexpected challenge during installation.“I realized that the HVAC venting for the toe kick vent was going to be behind the dishwasher. I’d neglected to give the vent placement information to IKD designer, Chuck. But, this was another way the IKD plans came in handy. I knew I could change the order of the cabinets on the window run and still have everything work out. Ultimately, we put the trash bin to the right of the sink and moved the dishwasher to the left,” she says. Knowing what you want makes all the difference. Just ask IKD customer Jenny who was looking for more storage in her galley-style NYC kitchen while incorporating unique design elements. “Our original kitchen was a disaster. My main wish was for tons of storage and prep space in a practical useable space. I also wanted to incorporate natural classic materials and gold accents for warmth,” she explains. So, Jenny chose IKEA SEKTION cabinetry framework, which she matched with Light Gray Shaker style cabinetry from Semihandmade. “My original budget was about $15,000 and I went about $10,000 over that,” she explains. “But I decided to splurge on the Semihandmade fronts, gold faucets from Newport Brass and the West Elm lights. I also got a lot of things from Amazon, like the sink, which was only $95.” She continues: “I got the tile at TileBar and it was a splurge for the marble backsplash but that’s my favorite part. It pulls in the gray from the flooring and cabinetry.” Whirlpool appliances round out the look. However, Jenny couldn’t do it alone, and she worked with IKD to design the space properly. She also hired a local contractor, High Vision Construction, of Tuckahoe, NY to install the kitchen. This was critical because getting those materials in without help would have been impossible. “I originally ordered IKEA KARLBY veneer countertops because the solid oak IKEA HAMMARP was out of stock. However, the longest pieces they had available for either type was 8’ long and my counters were 10’ long. The IKEA guy told me I could glue two pieces together so it became a rushed decision. When I thought about it, I realized I didn’t want two glued pieces of countertop where the grain would not match,” she explains. “I wound up finding 10’ butcher block countertops from Home Depot. As a result, I had to take 700 pounds of IKEA countertops back to the store in Brooklyn! 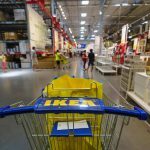 IKEA refunded me, but at the time it was pretty chaotic.” Similarly, she originally ordered Delta Faucets but returned them as they were not the true brass color she desired. Having design guidance was equally important when incorporating the quaint eating nook she wanted as well. “I really wanted the eating nook by the window but that was impractical based on it being right by the stove. We ended up going with the traditional galley kitchen with the eating nook by the door instead,” she says. Jenny offers advice for those starting their own IKEA kitchen. “Definitely don’t be afraid to delay the project to get what you love,” she says. “If I hadn’t switched the countertops and the faucets I would’ve regretted it.” Let’s see how Jenny was able to make her design work! Jenny was open to using IKEA cabinetry throughout, but ultimately decided on Semihandmade’s Light Gray Shaker door style. “I wanted to maximize storage, maintain affordability, and spice up visual interest by mixing up shelving and closed cabinets,” she says. “And I wanted to display nice looking things and hide uglier things, like Tupperware pieces.” This was key as her original kitchen was dark, cramped and had inefficient storage, such as wire racks pressed up against her refrigerator and limited counter space. To remedy this, the upper cabinetry is mixed asymmetrically throughout, over the long run of countertops along the wall by the refrigerator and above the food prep area and above the stove. 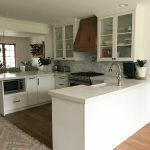 “Stylistically, these cabinets blended well with the butcher block countertops and the large Moroccan/Spanish tile design on the floor,” she notes. Likewise, the lower drawers provide extra storage space and a place to hide the garbage and recycling containers. “I also wanted a bigger refrigerator with side-by-side doors. I looked at counter depth ones and they didn’t have enough capacity. I had to choose between a sleek looking counter depth and a practical fridge that stuck out a few inches. I went with practical,” she describes. “I chose IKEA because they have a 25-year warranty and are known to have well-designed internal mechanisms. They are modular and offered a Tetris-like approach to design with different combos. I didn’t love their door options however, so that’s why I selected the Semihandmade doors,” she concludes. Though IKEA kitchens are known for their quality, there is a world of options for custom cabinet doors that extends far beyond the Swedish retailer’s offerings. Since 2011, Semihandmade has completed over 6000 IKEA kitchen, bathroom, closet and media projects and been named to Inc. Magazine’s list of the 500 fastest-growing private companies in the US. Brad’s IKEA kitchen features IMPRESSION drawer fronts and panels from Semihandmade (in midnight). This week I interviewed Semihandmade founder John McDonald. Semihandmade is based in Los Angeles and services both the United States and Canada.